Welcome to the inaugural issue of Democracy Counts, a monthly publication to update advocates, media, and interested persons on the latest census news, provide resources for advocates, and connect the census to issues you care about. The White House just announced the nominee to be the new director of the Census Bureau. He is Dr. Steven Dillingham of Virginia. If confirmed by the Senate, Dillingham would take over a bureau currently facing a range of challenges with less than 21 months before the census officially kicks off on April 1, 2020. Dillingham’s term would last through 2021. In an attempt to rig democracy, and effectively turbo-charge gerrymandering, Secretary Wilbur Ross and the Trump administration have chosen to add a question on citizenship to the 2020 Census. The question and will raise concerns in all households – citizens and non-citizen alike – about the confidentiality of their personal information and will cost cities and counties millions in government funding as people elect not to respond and thus go uncounted. The Commerce Department stated that a citizenship question on the 2020 Census would help the Department of Justice enforce voting rights. We now know that’s not true. Secretary Wilbur Ross, revealed for the first time that he began to consider adding a question on citizenship to the 2020 Census before the Department of Justice requested that he do so. In a memo released by the Commerce Department, Ross contradicts all previous statements that he’s made (including testimony before Congress) regarding the addition of a citizenship question on the 2020 Census. The recent release of more than 1,300 pages of internal Census Bureau documents reveals that Ross has been influenced by partisan political actors like Steve Bannon and Kris Kobach to add the question. His decision is opposed by a wide range of census stakeholders and experts, including 60 members of Congress, 161 Democratic and Republican mayors; six former Census directors from Republican and Democratic administrations; 19 attorneys general; the statistical community; and several dozen business leaders from across the country. If you remember, following President Trump’s inauguration, then chief strategist, Steve Bannon announced his plan for the ‘deconstruction’ of the administrative state. The breakdown of the Census Bureau fits right within this plan. What better way to breakdown government processes, than to sabotage the data administrative agencies rely on? The fight over the citizenship question is just getting started! There are currently seven separate lawsuits against Secretary Ross and the Census Bureau. The filers include the NAACP, the State of California, The Lawyers’ Committee for Civil Rights Under Law, the National Redistricting Foundation,MALDEF, ALCU, and a coalition comprised of New York State,17 other states, and six cities. Congress also has the power to stop the addition of a citizenship question. There are currently four bills that have been introduced in Congress to stop the citizenship question and/or change the current law to require the Secretary of Commerce to give advance notice to Congress before changing any questions on the census. The Commerce Department has also opened a 60 day public comment period to learn about the potential impact of adding a citizenship question to the 2020 Census. Responding during this comment period is key to the effort to STOP inclusion of the citizenship question. This is probably one of the most strategic actions we can take to help stop the citizenship question. Click here to submit your comment! Unfortunately, Congress’ failure to pass Fiscal Year (FY) 2017 appropriations bills on time, coupled with underfunding in the final “omnibus” appropriations bill, forced the Census Bureau to eliminate, vital planning activities. Due to these cuts, there is now only one field test in Providence County, Rhode Island before the main event and there are reports of it not going well. Self-response rates are at approximately 51% (which is good according to the Bureau), but there are reports of significant fear of enumerators currently doing non-response follow-up within immigrant communities. 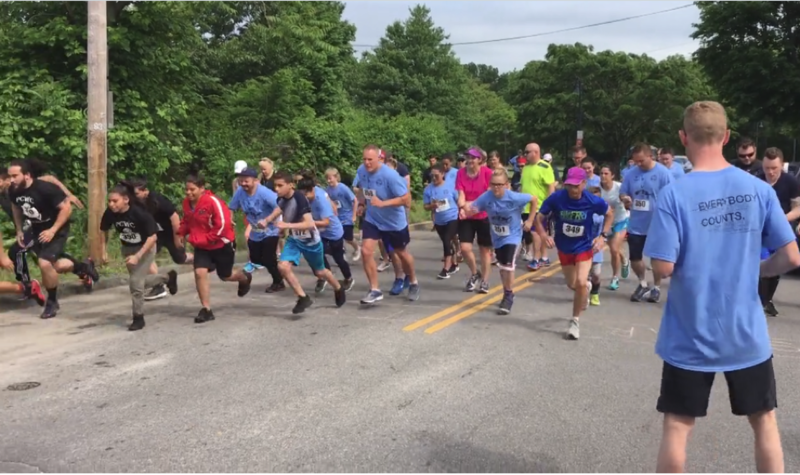 Last month, Common Cause RI partnered with the city of Central Falls in Providence County on a ‘Test Run’ (pictured below) to raise awareness for the End-to-End test currently underway. More pictures from the race can be found here and video here. The NAACP has sued the state of Connecticut in the first statewide challenge against prison gerrymandering in the nation. Connecticut, like many states, disenfranchises incarcerated individuals and places its prisons primarily in rural areas. This occurs even though people in prison are unable to vote and are not legal residents of the jurisdictions where they are incarcerated. And it persists even though the lack of legal residency and ability to vote prevents people in prison from meaningfully participate in the life of the community. Rather than the Census Bureau addressing this long standing flaw in its counting, the Bureau announced in February that it will continue to count people in prison where they are incarcerated in 2020. So until the Census Bureau decides to change its practices, challenges like this one and state-and local-level reforms are the only hope we have to undo many of the ills of prison gerrymandering. Check out Common Cause’s latest report, Democracy Behind Bars that addresses the issue of prison gerrymandering and its impact on mass incarceration here. To subscribe to the Democracy Counts newsletter click here!